You walk into the barn, the horses nicker in excitement to see you and also with anticipation to get their breakfast. When prepping their feed, it is easy to determine what nutrients are found in each grain since these feeds come with a guaranteed analysis. But what about the hay? It can be difficult to know exactly what is inside those flakes of hay unless you do proper hay testing. And, what often looks like “good hay” may be lacking in nutrients. Hay testing is simply measuring the nutrients within a given sample representing at least 10% of the hay bales in your program. By having a general idea of the quality of your forage, it will enable you to provide the lowest cost ration possible to meet your performance expectations. Why Do I Need to Test My Hay? Forage is a vital part of the equine diet and is the foundation of your horse’s nutrition. You must first know what is in your horse’s hay before adding grain or supplementation. Without knowing the nutrient content of your hay, your horse could have either a deficiency or surplus in its required needs, both of which can affect his or her health. It is particularly important to test your hay when there is a bad harvest year, which can cause hay to be very low in protein and other key nutrients your horses need to develop and perform at their best. It is also imperative to test when horses are being relocated across the country. Hay varies by region, so not only is it important to introduce your horses to new hay gradually to avoid colic, but it is also vital to test your new hay supply to ensure its nutrient composition will meet your horse’s requirements. 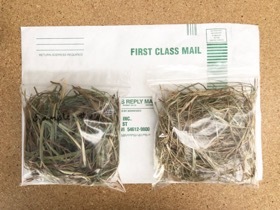 Dr. Lynsey Whitacre, BioZyme® Companion Animal Business Development & Field Support, recently tested her hay supply including one bale of orchard alfalfa and one bale of plain coastal grass hay, both samples shown below. The alfalfa mix (left) is significantly greener and based on perceived quality and cost per bale, she predicted it should contain greater protein. Interestingly enough, that was not the case. The results pictured at the bottom of the page show the hay proteins were both low and practically equal in value! Lynsey noted, “It [orchard alfalfa] cost almost twice as much, so I won’t be buying it anymore!” This is the perfect example of why you cannot judge your hay by its looks, price, or hay type, but instead should always test your hay. How do I test my hay? Many agricultural laboratories and state extension offices provide hay testing for minimal cost. BioZyme can assist with this process and will provide free hay testing to Vitalize customers. Contact your ASM to get started. If you have questions, you can also contact BioZyme at 1-800-821-3070.